Modernism From Right to Left: Wallace Stevens, the Thirties, and Literary Radicalism By Alan Filreis. Cambridge University Press, 1994. 376 pp. $49.95 cloth. The literary 1930s have traditionally been viewed in terms of the artists' and critics' flirtation, disenchantment with, and/or rejection of radical politics. On the other hand, Modernists, though their careers generally spanned the thirties, are typically discussed in terms of conservative politics and classicist aesthetics. Only recently have scholars begun to pay attention to what should have been an obvious overlap between the two. 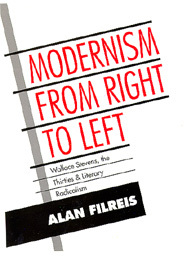 Alan Filreis's Modernism from Right to Left: Wallace Stevens, the Thirties, and Literary Radicalism is excellent work in that vein--required reading for anyone interested in the mesh of literature and politics in the 1930s as well as for anyone willing to see Modernist art as actively connected to the hubbub of its time. Filreis not only thoroughly describes and analyzes the literary milieu of the period, but he marshals evidence to show that Wallace Stevens, though ensconced in the executive suites of the insurance industry, wrote his poetry in contact with that milieu. In Filreis's words, "The interaction . . . between noncommunists like Stevens and the literary-political forces of their time--forces set routinely into motion by journal editors, poets, and especially reviewers--was remarkably dynamic." This is New Historicism fulfilling much of its promise, and Filreis does it without bogging his book in jargon. As a result, his work is accessible to almost anyone seeking help with Stevens' poems from the thirties. The final chapter, for instance, offers a particularly detailed and coherent analysis of "The Man with the Blue Guitar," viewing the poem as Stevens' attempt to answer even as it absorbs and digests much of the criticism of his work by the left. In short, though narrow in its scope, Filreis's book is a worthy addition to scholarship--James Longenbach's Wallace Stevens: the Plain Sense of Things and Frank Lentricchia's Modernist Quartet come to mind--attempting to historicize Stevens' achievement and to rethink a turbulent literary era.